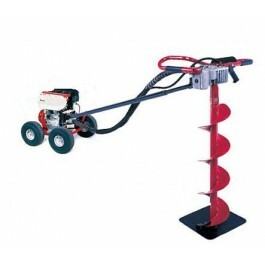 Revolving at 180 RPM, it is the perfect one-man drill for landscaping the toughest ground. Increases drilling productivity and results in cleaner holes. Features a Honda GX160 OHV engine with 10-inch pneumatic tires and 20:1 transmission. Auger not included. Dig hard, rocky ground in no time with this 20:1 post hole digger by Little Beaver. This drill's slow-speed gear ratio will allow you to drill the toughest earth and clay. 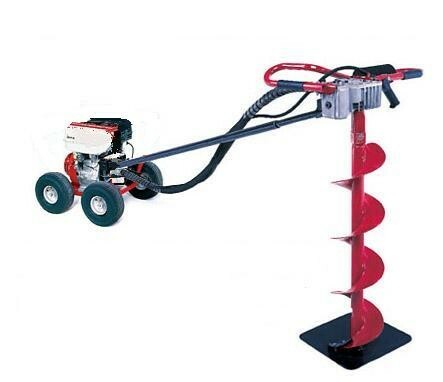 Revolving at 180 RPM, it is the perfect one-man drill for landscaping, sign erection, deck work and fencing. Not only does this increase your drilling productivity, but it also results in cleaner holes. Post hole digger features a Honda GX160 OHV engine with 10-inch pneumatic tires and 20:1 transmission. Auger not included.